I don’t know about you, but when I heard that Thalia Zedek had formed a band with guys from Karate and Neptune, the resultant titanic catharsis is not the kind of fruit that I expected such a collaboration to bear. Then again, I am not sure what I expected. You might think, we will get the rustic slowcore/angular angst dichotomy of Gavin McCarthy’s Karate, or the proto noise punk melees of Jason Sanford’s Neptune; hell, even Sanford’s own avant garde feedback machinations. You would definitely have thought that Zedek’s latter-day folk imprint would be slathered all over this. 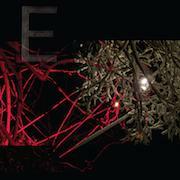 As I said, I wasn’t sure what I expected…but certainly not something as rugged, rambunctious and riled up as E, the trio’s self-titled album that rattles and rails against the Thrill Jockey cages with flayed abandon. E may stand out as an empty signifier as Sanford maintains in a recent interview – a letter whose monotony as a precursor to technological short hand and jargon pushes it to the brink of inanity - but the band fill up this dead space with enough puncturing visceral grit and a heaving undertone of loss and burgeoning redemption to reclaim the letter – in this case, to represent eviscerating, effusive, elegant euphoria. Eschewing a bass for a double guitar and drums caterwaul, E is brittle and bruising. ‘Great Light’ starts off with a White Hills/Boris riff noise blast, McCarthy’s drumming throwing us headlong at the wall – one third instrumental hedonism, one third Zedek-led shamanist projectioning, one third Sanford-led deep and empty growled incantation – “I command it” both weary and threatening. ‘Delicate Fingers’ feels like the inverse of this – opening with a simple guitar line, there is a lot of velvety space to be incrementally added to, Sanford’s baritone invoking impious spirits that finally launch forth through disjointed crossed guitar lines and Zedek’s impassioned wail. There is something archaically tactile about these songs too – the compositions and their structure seem gangly and cumbersome, larger than life, of gargantuan mass, yet ancient and bucolic, indebted to the earth and the ages – stablemates Wrekmeister Harmonies mine similar sonic ore. But it is even more roughshod than that – I can’t help but picture charcoal imagery of fervent fury and fear when I hear these songs, scrawled out with juxtaposing German expressionistic touchstones of naivety and the primordial, the sacred and the scarred. Each member’s lyrical proclivity, musical preference and sonic muscularity are given equal measure, a pagan triumvirate of penetrating, pointed liberation.